As you’re probably well aware, we here at Madewell know a thing or two about denim—after all, the brand has been carefully making it since 1937. And because our heritage is such an important part of who we are, we have an in-house capsule collection called Rivet & Thread devoted to keeping it alive. We asked our resident denim designer (and all-around jeans guru) Tonya to give us a quick primer on Rivet & Thread so, you know, we can finish crafting our seasonal denim wish list (believe us, it’s already crazy long). So what exactly is Rivet & Thread? Rivet & Thread is our premium line inspired by heritage Madewell. 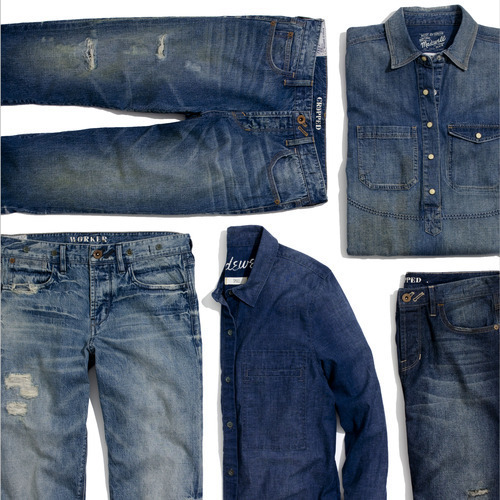 The line uses selvedge Japanese denim exclusively, with special vintage-inspired washes that give the denim a uniquely cool worn-in feel. Where does inspiration for the pieces come from? We pull details, washes and fits from our archive of vintage Madewell denim as well as pieces from numerous old vintage workwear companies that sadly aren’t around anymore. What are some of the standout R&T items to look for this season? We are really excited about our new premium cropped jeans coming out in the spring. The fit came from a vintage pant that we unearthed at the Rose Bowl Flea Market in LA. It comes with a shorter inseam and slouches like a classic men’s jean and we are offering it in two amazing vintage washes. We also brought back our Worker Jeans that sit slouchy on the waist but slightly lower than the cropped jeans, and have a slightly tapered leg. This entry was posted in Uncategorized and tagged denim, fashion, madewell, rivet and thread. Bookmark the permalink.